The stunning natural beauty and diversity of CHILE is amongst the finest in LATIN AMERICA. This slim country that stretches 4300 kms is home to a variety of Geological forms. The fascinating Atacama Desert in the North to the Massive freezing Glaciers in the south. The Torres Del paine and the Chilean Patagonia - Heaven On earth. A Chilean fjord cruise is a breathtaking adventure experience indeed ! Historical landmarks such as the Rapu Nui (Easter Island) and Isla Robinson Crusoe give you a feel of what the term ‘Discovery’ really meant in the not so electronic era. Santiago is a wonderful cosmopolitan city and gives you a flavour of the true Chilean culture ! The surrounding picturesque areas of Valparaiso and the wineries make the region a tourist paradise. Chile is about great cuisine, good wines and grand hosts! The lake district towns of Pucon and Puerto Montt and the Torres del Paine National Parks are known for their flora – fauna . Nature at its best is seen in some of the most marvellous landscapes. 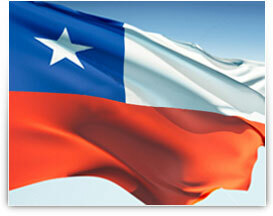 CHILE is much about character and the vibration is known to have brought out the creative best in many voyagers. Chileans enjoy their weekly barbecue and Red wine! Chile is known for making Philosophers out of Presidents and Friends out of Strangers.